Head to the top of the Teide volcano on Spain’s Tenerife island next week, and chances are you’ll find half the Tour de France peloton warming up their engines. Altitude training has become the magical tonic for the peloton’s elite, with the likes of Chris Froome (Sky), Vincenzo Nibali (Astana), and Alberto Contador (Tinkoff-Saxo) spending weeks, if not months, at such high-altitude places as Tenerife, Gran Canaria, St. Moritz, or Sierra Nevada. One rider who you won’t find making these pilgrimages is one who doesn’t need to: Nairo Quintana. The plucky Colombian rider was fortunate to have been born and to live at very near the same elevation as these new, trendy high spots on the European landscape. So while the likes of Froome and Contador grumble about boring hotel lobbies and isolation from family and friends, Quintana can sleep in his own bed at night, and eat momma’s cooking if he wants to. Over the weekend, Quintana spoke to the Colombian media about his looming date with destiny, and his approach to the Tour de France. The 25-year-old was quick to downplay his chances despite being the favorite in the eyes of many. “We should remember that Contador has won three Tours, Nibali has won three grand tours, and Froome has also won a Tour, so compared to them, I am the one who’s won the least,” Quintana said during the press conference in Bogotá. Quintana addressed his national media as the hype begins to build in his native Colombia that he could become the first Latin American to win the Tour. Quintana won the 2014 Giro d’Italia and was second in the 2013 Tour — two historical milestones for Colombian cycling — and now many see him as a giant-killer for this year’s Tour. With a mountainous final week, Quintana could be poised to make history, if he can survive the Tour’s brutal first week or so with his GC options intact. Quintana returned to Colombia following a short but modestly successful spring campaign across Europe, winning Tirreno-Adriatico, with fourth at the Vuelta al País Vasco, and eighth at the Tour de Romandie. His hometown of Cómbita is at 9,252 feet, and he lives even a bit higher above town settled in the shadow of the Colombian Andes. In an earlier interview with VeloNews, Quintana said he prefers to return home to train rather than spending weeks at altitude on the top of some desolate volcano. Quintana will be making his highly anticipated return to the Tour in just a matter of weeks. 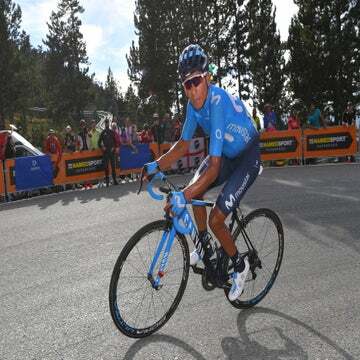 After Movistar team boss Eusebio Unzué steered him clear of the Tour last year, opening the door for him to win the Giro, the team will be unleashing a wiser and more-experienced Quintana on the Tour this year. And it seems the Tour de France organization has delivered a route that is ideal for the explosive climber. Quintana already did his homework this spring while in Europe, previewing the decisive cobblestone stage as well as racing in some of the northern classics to get a taste of hitting the pavé at race speed. Quintana will return to Europe this week to race the Route du Sud (June 18-21) to put some racing speed into his legs before the Tour starts on July 4 in Utrecht. Quintana also said the presence of podium-threat Alejandro Valverde will give Movistar a rare double-punch that other teams will not bring to the Tour. After failing to reach the podium last year with fourth overall, Valverde has promised to work for Quintana in the GC. Movistar has also revealed its “long list” for the Tour de France. With Valverde and Quintana as co-captains, the team will choose seven other riders to ride in support from this pre-selected pool of 11 riders: Winner Anacona, Eros Capecchi, Jonathan Castroviejo, Imanol Erviti, John Gadret, José Herrada, Gorka Izagirre, Adriano Malori, José Joaquín Rojas, Rory Sutherland and Fran Ventoso.